Upon entering the perivitelline space, the spermatozoon attaches to the ovum plasma membrane (oolemma) and, through a series of complex molecular interactions, the membranes of the two gametes fuse to form a diploid cell. Initial attachment of the spermatozoon inner acrosomal membrane is followed by firm adhesion of the equatorial segment and the posterior head to the oolemma. In several mammals, adhesion is mediated by disintegrin domains of ADAM (acronym for disintegrin and metalloprotease domain) and cysteine-rich secretory proteins (CRISP) on the sperm membrane interacting with integrins, tetra-spanins, integrin-associated proteins, and unidentified molecules on the ovum membrane. Fertilin a (ADAM 1), fertilin p (ADAM 2), and cyritestin (ADAM 3) undergo proteolytic processing between the metalloprotease and disintegrin domains so that only disintegrin domains, cysteine-rich domains, and EGF-like repeats remain on the sperm surface. Fertilin a and p form heterodimers in bovine, guinea pig, and mouse sperm that attach to the a and p ligand-binding sites of ova integrins; however, fertilin a and cyritestin are not essential for binding of human sperm. Integrins are a family of heterodimeric cell adhesion molecules that includes 18 a and 8 p subunits that combine to produce 24 integrins. Epididymal CRISP proteins are detected on the postacrosomal region of the head and on the midpiece and principal piece of the tail of rat, mouse, horse, human, and rhesus monkey sperm. However, the mechanism by which CRISP proteins participate in gamete membrane interactions is unknown. Tetraspanin CD9 appears to be a component of the multimeric molecular complex as ova from CD9 knockout mice do not undergo sperm oolemma fusion. Sperm attachment may also require tail motility, but it decreases or stops within seconds after sperm oolemma fusion. Proposed molecular mechanisms for the fusion process are primarily hypothetical. The ovum engulfs the spermatozoon through a process similar to phagocytosis, beginning with the inner acrosomal membrane and eventually incorporating the tail. Fusion of the spermatozoon and the ovum plasma membrane causes formation of a fusion pore and, ultimately, incorporation of one membrane into the other, followed by incorporation of the paternal cytoplasm and DNA, the sperm centriole, and a sperm factor(s) (e.g., glucosamine-6-phosphate isomer-ase), which initiates egg activation. An early event in egg activation is an increase in cytosolic calcium that induces resumption of meiosis, exocytosis of the cortical granules, and the vitelline block. Release of the cortical granule contents (e.g., mucopolysaccharides, proteases, plasmino-gen activator, acid phosphatase, and peroxidase) increases the volume of the perivitelline space, modifies or hardens the ZP, and degrades sperm-binding proteins to prevent fusion of the ovum plasma membrane with additional sperm (i.e., polyspermy, a lethal condition). Release of calcium stores in the endoplasmic reticulum is induced by inositol 1,4,5-tr/s-phosphate binding to its receptor. The inositol 1,4,5-tns-phosphate may be induced either by a sperm phospholipase C stimulatory factor or by stimulation of egg phospholipase C through signal trans-duction pathways. Subsequent egg activation responses include recruitment of maternal mRNAs for translational changes in protein syntheses. Resumption of the cell cycle begins with a second meiotic division, followed by extrusion of the second polar body and formation of the female pronucleus a few hours after gamete fusion. Similarly, the nucleus of the spermatozoon is decondensed and transformed into a male pronucleus. Both maternal chromatin and male pronuclear development are regulated by common egg cytoplasmic cell-cycle regulatory factors through a series of transformations that restore the transcriptional competence of the inactive gamete chromatin. Spatial organization of the microtubule arrays in a cell is largely dependent on the centrosome contributed by the spermatozoon in most primate and animal species, except mice. The centrosome consists of two centrioles and pericentriolar material, and is responsible for nucleation of the microtubules and formation of the mitotic spindle between opposed pronuclei. At fusion, the sperm tail is incorporated into the ooplasm, and its centriolar region forms the sperm aster. 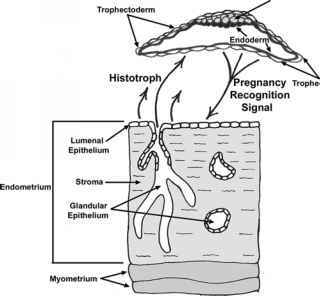 While the sperm head is decondensing, the aster guides the female pronucleus toward the male pronucleus and increases in size as the two pronuclei migrate toward the center of the egg. The centriole duplicates during the pronuclear stage, and syngamy centrioles are found at opposite poles of the first cleavage. Migration of the pronuclei into their juxtaposition is followed by breakdown of the pronuclear envelope, giving rise to a group of chromosomes for the ensuing cell division. Subsequently, maternally and paternally derived chromosomes intermix to establish the embryonic diploid genome and initiate embryogenesis.